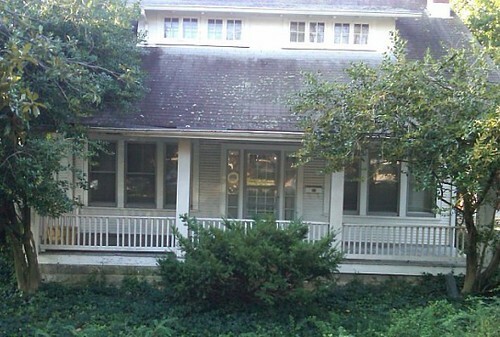 For years, this house was the subject of much neighborhood chatter and many complaints. 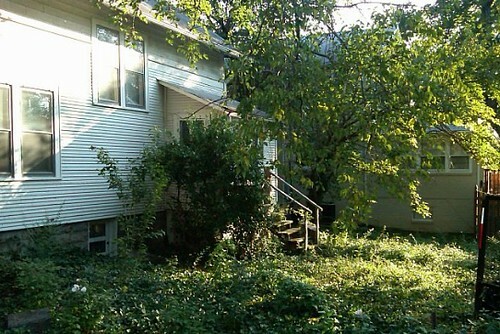 Overgrown with trees, shrubs and a 2-foot blanket of ivy, no one really knew what the house looked like. Until Carol came along. 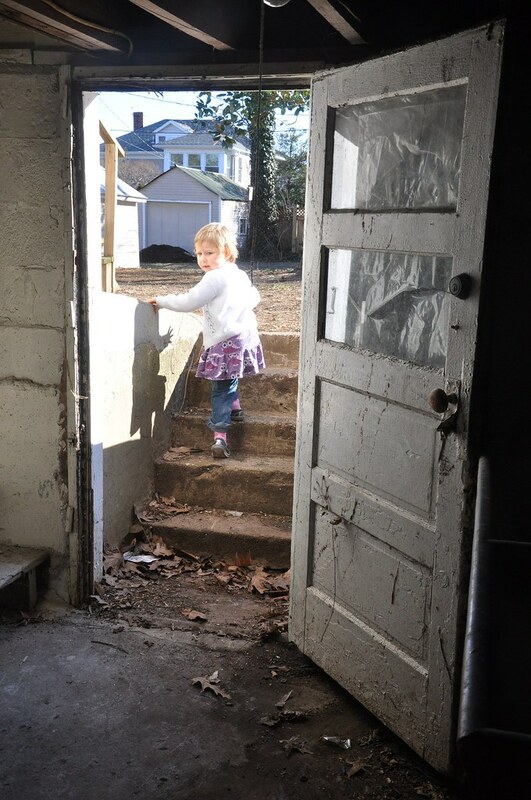 Carol was living in an apartment in Alexandria and had her sights set on buying a fixer-upper. 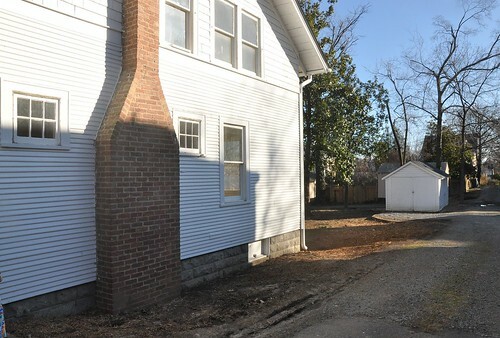 When this house came on the market, she scooped it right up. Through a lead from local realtor Jen Walker, we contacted Carol to learn more about her plans. She graciously invited us over last weekend for a tour. 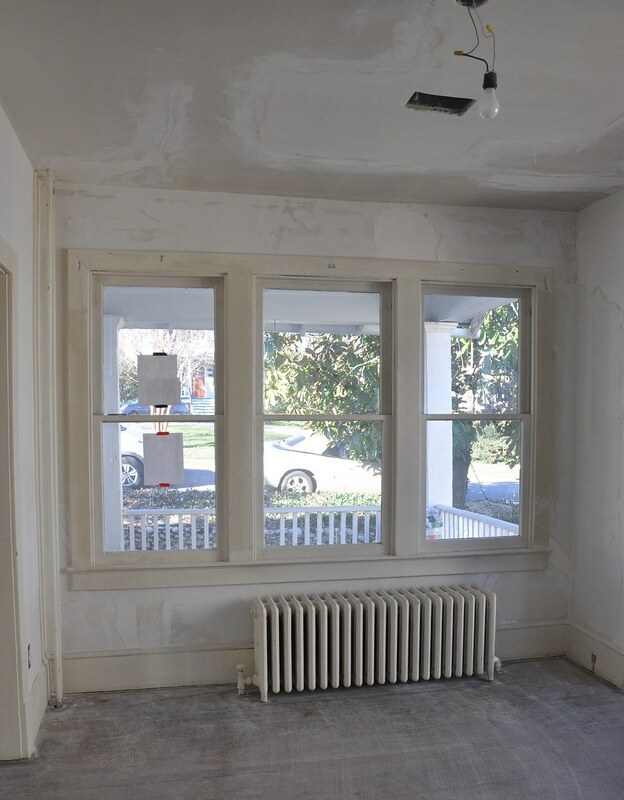 You will see that the house still needs a lot of work, but Carol has made some tremendous progress and it won’t be long before this classic bungalow sparkles in all its 1920s splendor. 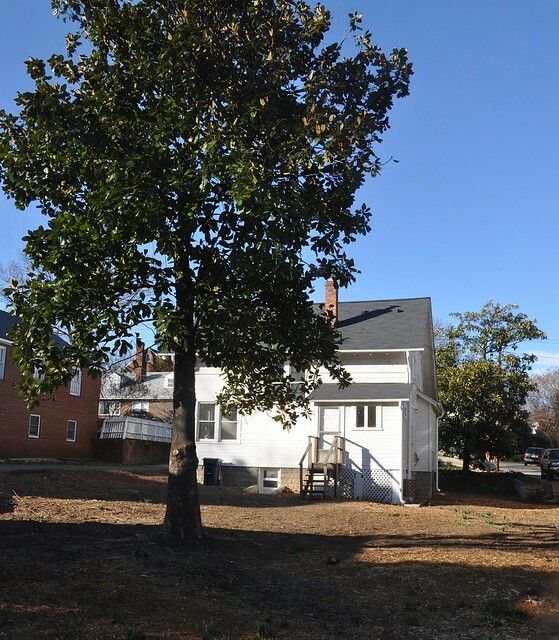 Here is the house now after ivy, shrubs, and nearly 15 damaged trees have been removed. 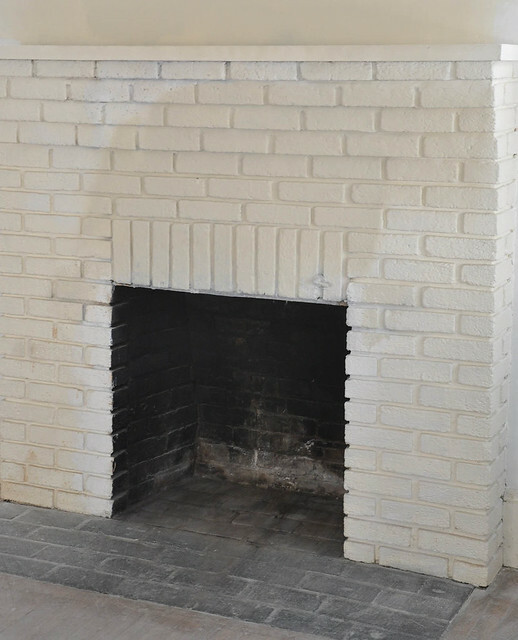 The front door opens to a spacious living room with brick fireplace on one side and a dining room on the other. 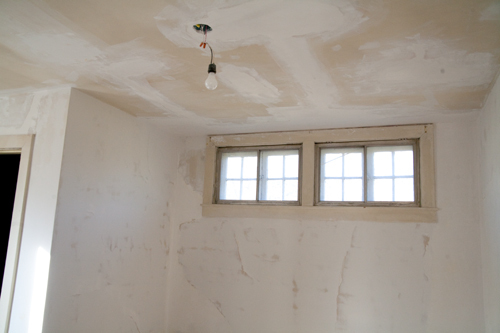 Before, the walls and ceilings had significant plaster damage. Now, spackled and smooth, they are just about ready for some paint. 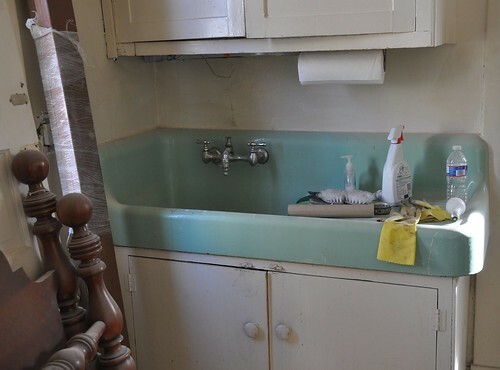 A kitchen renovation won’t happen for a few more years, so this sea green sink will be around for a while (ok by us — we’re loving it!). In order get loan approval, Carol needed a functional stove. She bought a matching biscuit-color stove and refrigerator off Craig’s List for $100 a piece. 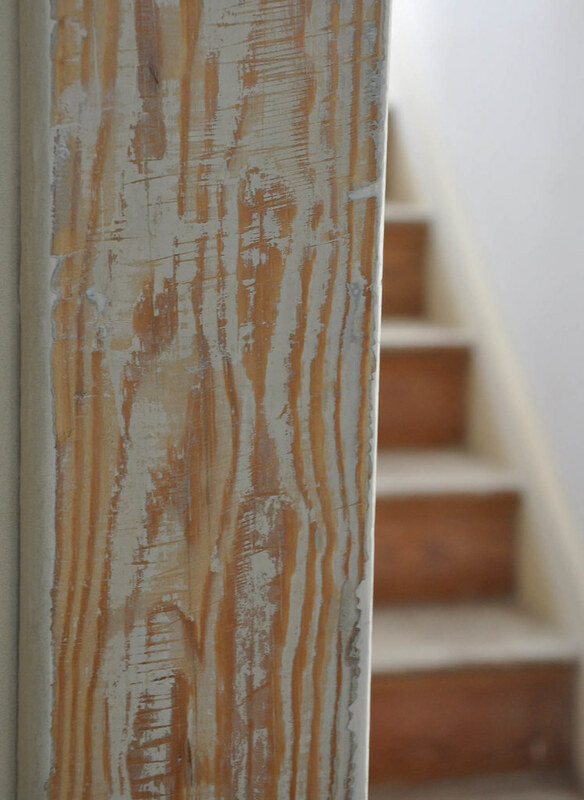 Homes from the 1920s most definitely have lead paint, so Carol has taken the necessary precautions while stripping the surfaces, including using a respirator and speedheater infrared paint remover. 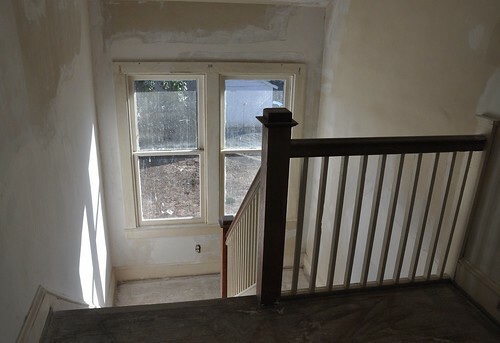 One of my favorite areas is the open and airy stairway. You can pause on the landing on your way up, catch your breath, and gaze out the huge window overlooking the deep backyard. 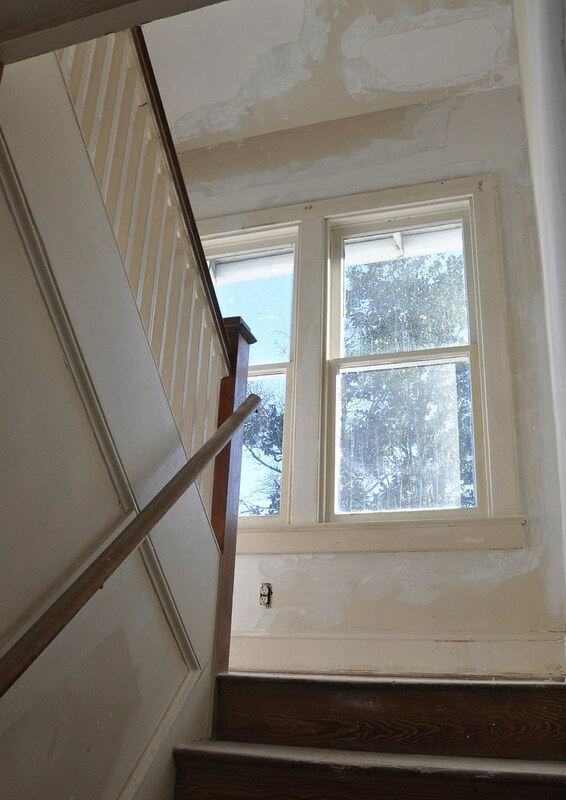 The second floor boasts the bathroom and three large bedrooms. 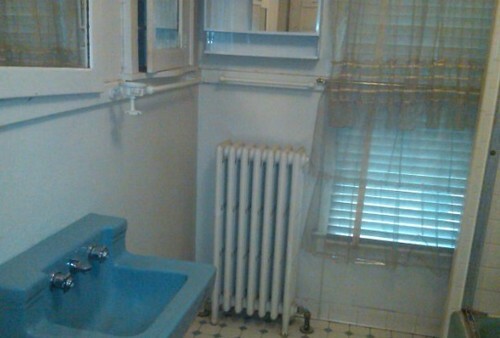 The bathroom is the only room Carol is actually renovating before moving in later this Spring. 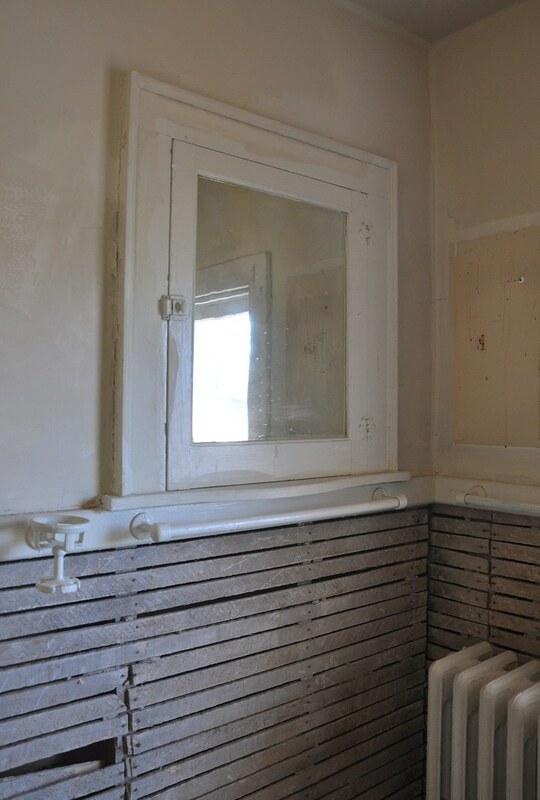 The walls need plaster, the floor needs tiles, and the room needs a tub and toilet, but the original medicine cabinet and fixtures are staying. On the day we visited, the functioning furnace as well as the bright sun kept the upstairs warm and toasty. Unfortunately, it looks like it will be just as toasty this summer as the house doesn’t currently have air conditioning. During renovations, Carol is adding the necessary duct work and will later install air conditioning as the budget permits. 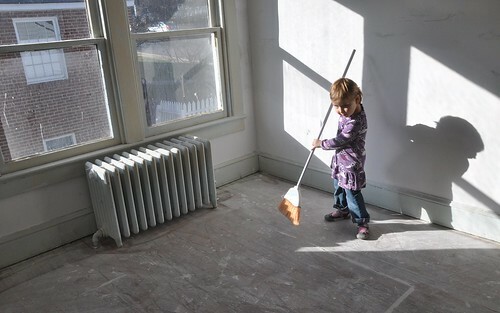 Leslie’s daughter Nadja has already started cleaning this room. I think she wants to move in. Dark and a little scary, the basement holds what Carol says sealed the deal. The previous owner mounted these jars on the floor joists for storing hardware. 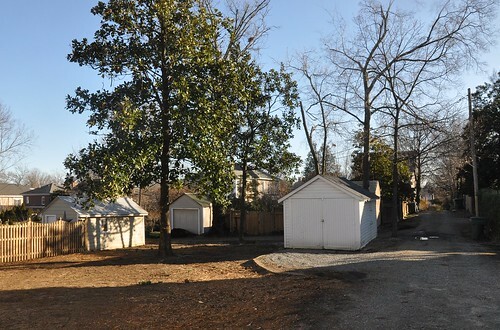 When she saw the jam jars from North Carolina, she knew she had to have the house. 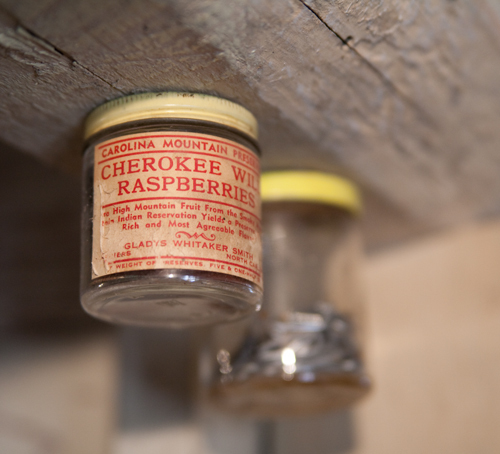 The jam had been made in Cherokee, NC where her parents had taken her and her brother to vacation. 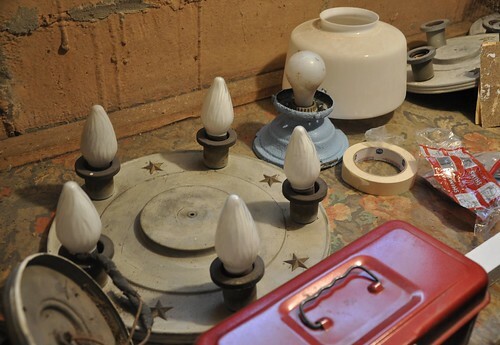 In a back room in the basement, she’s temporarily storing the old kitchen cabinets and some vintage lighting fixtures which she hopes to reuse. Though excited to move in, Carol is taking the process slowly to make sure she does it right. 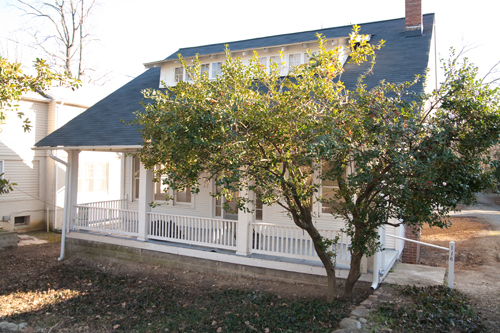 Years ago, she renovated her grandmother’s bungalow so she understands what’s involved and she wants to be mindful of the home’s history and classic architectural style. Carol plans to do a lot of the manual labor herself, but she is contracting out some of the major jobs, such as replacing the roof and upgrading the old knob and tube electrical throughout the house. Carol’s enthusiaism for DIY is infectious. 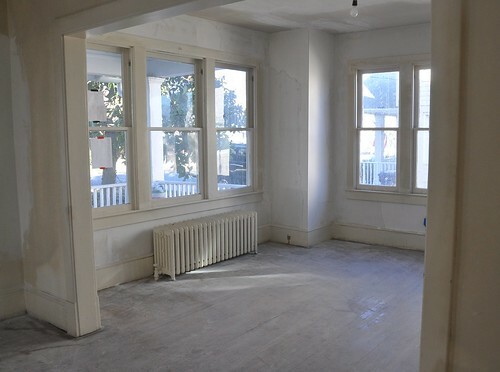 Walking on the tour, I think I can speak for the rest of us that we secretly imagined how we would renovate and decorate the house if it was ours. 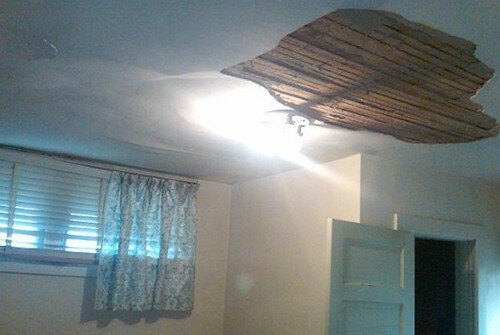 It’s definitely inspiring to see a homeowner who truly loves their home. Hearing Carol talk about her plans and sharing her incredible knowledge of historic preservation was a true delight. We cannot wait to come back and see how she works her magic. Great story! I love to see these old gems repaired and brought back to life. I am thinking I would have to keep that kitchen sink! 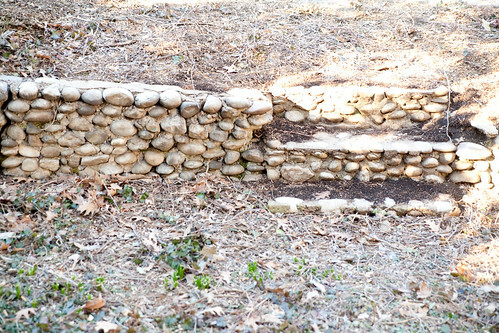 I can’t wait to see what it looks like when it is complete. I love renovation projects. The staircase is beautiful!!! 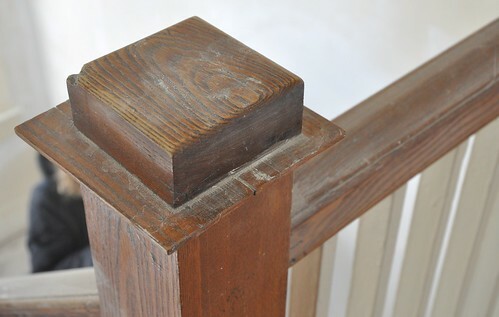 How amazing to have such original details preserved! 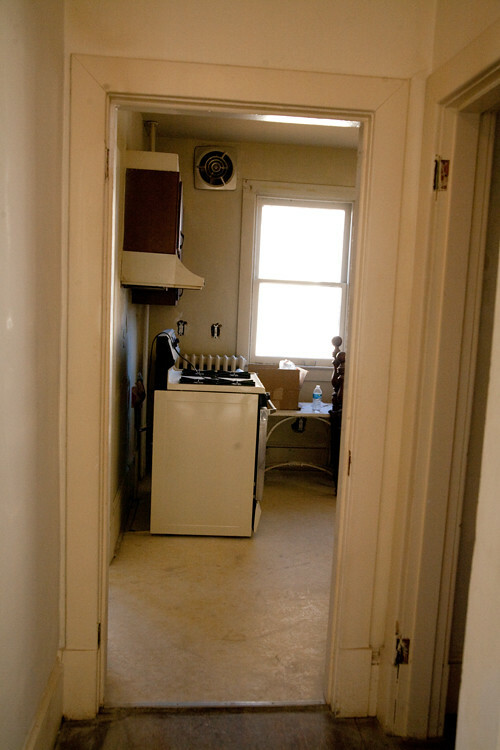 My heart skipped a beat at the sight of that kitchen sink and light fixture adorned with stars. Go Carol!